QTM Electrical (QTM) was recently awarded the traffic signal upgrade for Joondalup Drive and Ocean Reef Road intersection in Edgewater, with works currently underway. The total project, which is made up of $1.5 million from the State Government and $165,000 from the City of Joondalup, was awarded to Tracc Civil, with the traffic signal component awarded to QTM. 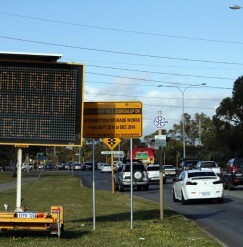 An additional signalled turn lane on Joondalup Drive for vehicles heading east on Ocean Reef Road. An extension to the existing right and left turn lanes along Ocean Reef Road onto Joondalup Drive to reduce vehicle queues. Improved pedestrian crossings and the provision of a shared path connection along the northern verge of Ocean Reef Road between Joondalup Drive and Edgewater Drive. Joondalup Mayor Troy Pickard said the Joondalup Drive-Ocean Reef Road intersection was an important part of the City’s road network and the upgrades will provide convenient and efficient traffic movement. “Traffic issues in Edgewater have grown in recent years and the City has taken steps to address this, firstly by undertaking detailed analysis of the traffic conditions in and around the suburb as well as assessing potential solutions,” Mayor Pickard said. “The result of this analysis is a significant upgrade of the intersection that will allow for better flow of vehicles now and into the future. QTM will be responsible for the decommissioning and removal of the existing traffic signals and the installation of the new traffic signals at the intersection. QTM’s Managing Director Greg Bendall said that it was great for the company to be involved in such a significant State Government-funded project. “We know the upgrade to this intersection in Edgewater has been a priority for its residents and we are looking forward to providing better access and a safer intersection at Joondalup Drive and Ocean Reef Road,” he said. For more information about Quality Traffic Management Pty Ltd and its range of traffic management, electrical contracting and traffic engineering services click here.